What you can benefit from Roterdon Ankle support? 3D knitting technology matching different jointshigher quality material enable our compression sleeves are breathable, absorbing sweat, keeps your feet dry & warm and odor free! Ankle compression sleeve can be wear independent or wear together with socks and shoes, without uncomfortable. Running or jogging, hiking, football, volleyball, jumpping soccer, training, crossfit, gymnastics, finishing etc. indoor or outdoor sports activies. All kinds of ankle joint discomfort. CLICK ADD TO CART AND order a quality ankle brace for yourself or sweet family now! ▼ PREMIUM QUALITY: Our ankle sleeves are manufactured to provide superior support, comfort, and relief without compromising your mobility. Tight, form fitting, and breathable compression fabric maintains joint stability regardless of activity, helps improve blood circulation and eases pain from heel spurs, Achilles tendon heel etc., while avoiding the itchiness common to neoprene supports. Quick at absorbing sweat and keeps your feet dry and odor free, gives you hours of continuous use. ▼ PUSH YOURSELF TO THE LIMIT: Our ankle supports are the perfect fit for any activity requiring ankle movement, including Baseball,Running, Crossfit, Soccer Golf, Hiking,Tennis, Basketball,Volleyball and more.You'll be able to enjoy exceptional ankle support while still maintaining your peak performance and full range of leg motion. ▼ BREATHTAKING DESIGN & PERFECT FIT : Whether you've got meaty ankles, or are a little bit slender, we've got a fit for you with the Special knitted technical design that matches different joints. The simply design suitable for wearing with different types shoes or socks which will made you more fashionable. The special fabric gives you a smooth and soft feel so you can wear them all day long. 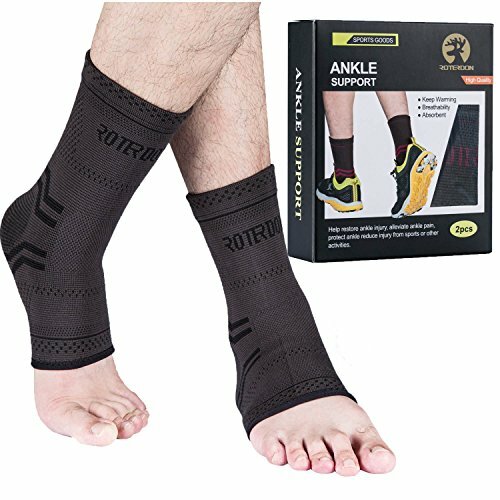 ▼ PHENOMENAL PROTECTION: ROTERDON ankle braces apply even pressure across your ankle joint, which provides ultimate pain relief from a variety of ailments including plantar fasciitis, sprains,swelling,tendonitis,arthritis, muscle fatigue, and other ankle pain. With our sleeves you'll be able to tackle any activity life throws your way, while ensuring you're a step ahead in injury prevention. If you have any questions about this product by ROTERDON, contact us by completing and submitting the form below. If you are looking for a specif part number, please include it with your message.